Tsunami Warning Systems describes the processes involved in anticipating, detecting, and warning for a tsunami by summarizing data collection, modeling, analysis, and alert procedures used at NOAA's Tsunami Warning Centers. A simulated event and past tsunami occurrences are used to highlight warning system processes for determining the tsunami threat based on seismic and sea level data and tsunami forecast models. Message communication and local response are also addressed as final components of any warning system. The module is intended for Weather Forecast Office staff and emergency managers who require a better understanding of the technical aspects of tsunami warning delivery. 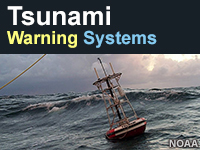 The module will also benefit anyone wanting to learn more about the components of tsunami warning systems. Thank you very much. It was very informative. Excellent course as an introductory to the Tsunami Warning System currently in place globally. Particularly important where you might be heavily involved in coastal work/projects. This module was very good, it was a bit over my head, but I passed so I must have understood. They explained things well. I enjoyed the exercises in this module. For those of up that like solving puzzles of all types, this is a great experience. Explain the significance of each component of a Tsunami Warning System, as well as the importance of the interconnections of the components within the entire system. Describe the complexity and the challenges of issuing tsunami alerts, including the short timeframes and limited warning window, the potential wide extent of damage, and the high degree of variability depending on earthquake location and source parameters. 2017-12-07: Link updates were made to direct learners to the new U.S. Tsunami Warning System page, which includes both National Tsunami Warning Center and Pacific Tsunami Warning Center information. TsunamiReady Program links were also updated. 2016-01-07: This lesson was updated to reflect developments and changes to the tsunami warning process as of 2015. These include a 2013 renaming of the West Coast/Alaska Tsunami Warning Center to the National Tsunami Warning Center, examples of updated Warning Center products, new response criteria information, updated content about emerging technologies, and other refinements. The format for the lesson was updated to be more universally accessible across browsers and platforms. 2014-05-01: In October 2013, the West Coast/Alaska Tsunami Warning was renamed the National Tsunami Warning Center. This lesson currently reflects the previous name but is a candidate for a 2014 update.